Never run out of your favorite products again! With our automatic delivery program, you can enjoy the convenience of having products delivered to you monthly, bi-monthly or quarterly. You’ll also enjoy a 5% discount on all auto-ship orders. *Promotion subject to change. How do I sign up for Auto-Ship? 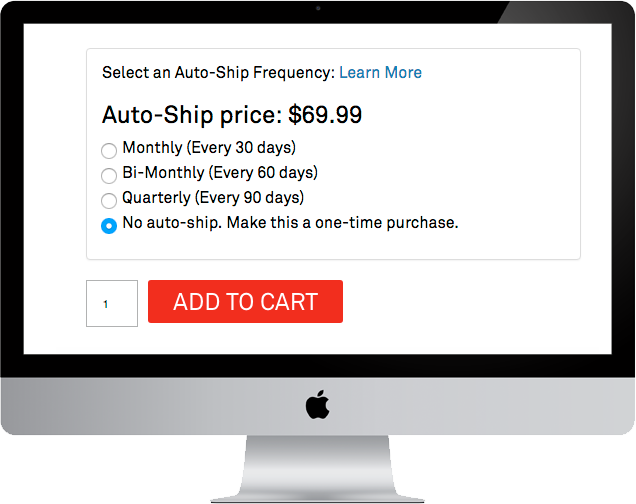 Items eligible for Auto-Ship will have reorder options displayed on the product page. Select how often you would like an automatic ship of the item to be delivered, and how many of the item you would like in each order on the cart page. When you’ve finished selecting items, simply proceed to checkout. Confirm that all the important details are correct (e.g. billing and shipping information, items, quantity, frequency, etc.) before you complete your order. 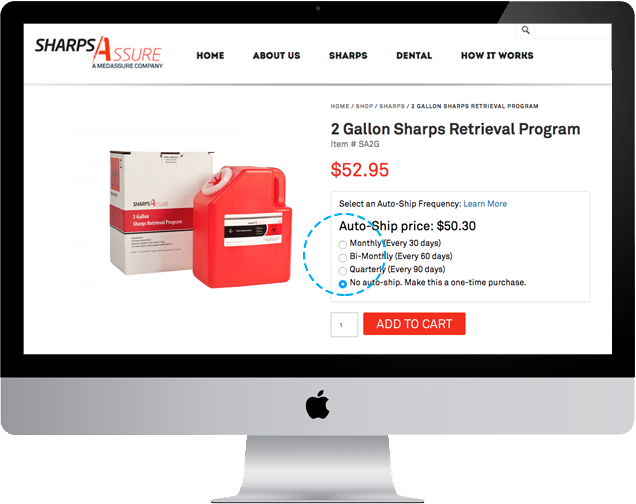 Once this first order is shipped, you can modify future shipments in your customer account. We’ll send you an order reminder 10 days before sending each of your reorders. You’ll be able to review the details of your order and make any adjustments necessary before it processes. How does auto ship help me save? All Sharps Assure items in auto ship will receive a 5% discount! You may save even more if the item is on sale at the time your reorder ships. Will my auto ship be the same as my original order? Prices and savings are subject to change. If the item is on sale at the time your reorder is placed, you’ll receive the greater of the two discounts. Any sales taxes that apply to your reorder will be based on the final price. The Auto-Reorder in the customer section allows you to change your preferences at any time. Changes you save to your reorder preferences will only affect future reorders, and will not affect any orders already in progress. If you make changes to the shipping addresses and payment methods saved on your account, this can affect the items you’ve set up for Auto-Reorder. Please always review your reminder emails to make sure that your reorder details are current and correct. We reserve the right to stop or change the Auto-Reorder program at any time without prior notice. We’ve made it easy to manage your subscriptions from your account login. You can easily change dates, cancel subscriptions, fast reorder, or temporarily pause subscriptions.